(Nanowerk News) Scientists of Tomsk Polytechnic University jointly with colleagues from Bangor University (United Kingdom) proposed a method to improve the resolution of optical microscopes operating in the reflection mode, i.e. 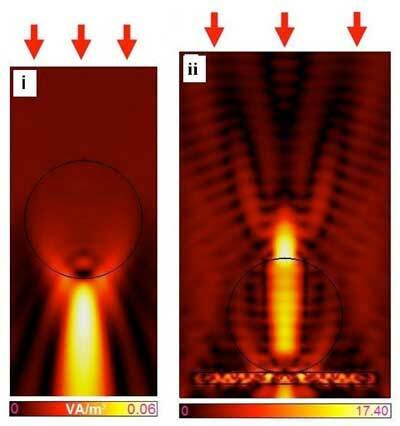 visualizing materials not transmitting light. Spherical dielectric particles with a refractive index close to air were applied as a superlens for the microscope. The objective of the research team is to improve the resolution of optical microscopes in this mode thus making them as close as possible to the sharpest nanoscopes. The latest results were published in one of the world oldest scientific journals Annalen der Physik ("Photonic Jet by a Near-Unity-Refractive-Index Sphere on a Dielectric Substrate with High Index Contrast"). In the last decade, the nanoscopes are developing rapidly. They are one of the sharpest microscopes among similar optical devices. They can ensure the 50 nanometers resolution in white light. These nanoscopes use dielectric spherical nanoparticles as lenses and operate in the transmission mode. In other words, an object is visualized by transmitting the radiation through the lens. However, there is a variety of materials non-transparent to radiation, the study of which requires subwave-focusing methods in the reflection mode. These may include metals. Previously, the research team from TPU demonstrated that the radiation could be focused in the reflection mode using rectangular or hemispherical particles (publication in Optics Letters). “However, the spherical particles are easier to obtain and use, that is why we used them in our latest research. The particle size makes several wavelengths. Light is reflected from a metal substrate, where particles are located, and is focused from the incidence side near the surface of the particle. If made spherical, it works as a lens focusing in the opposite direction. In addition, the refractive index of spherical particles is close to 1, i.e. to the air index, while traditional microscopes are close to 1.5. As a result, as compared to traditional optical microscopes, the spherical particles improve the resolution in the reflection mode and thereby exceed the diffraction limit. Eventually, we strive to make the results comparable with nanoscopes in the transmission mode,” - says Igor Minin, Professor of the Division for Electronic Engineering. The conducted study will lay the foundation for nanoscope design principles able to operate in two modes with high resolution. “These two modes of a microscope provide additional information on the distribution of near-field signals and open a new and unique method of characterizing materials and nanostructures. It will be possible to visualize a number of promising materials and objects in higher resolution. For example, surface plasmonic waves represent electromagnetic waves propagating along the boundary between a metal and a dielectric. They are used in plasmonic sensors for biochemical analyses in microelectronics and require very high resolution to study them”, - underlines one of the authors.